I have yet to share what's happened since purchasing the property. It all adds up to: the lot is cleared. That's it. End of story. Thank you for stopping by. Have a nice day. First off, we already had a pickup - it was a 2-door, 4-wheel drive 2000 Dodge Ram that purred like a kitten but looked like a bulldog that had been through one too many fights. We didn't care about its appearance as it did the job and it was paid off. 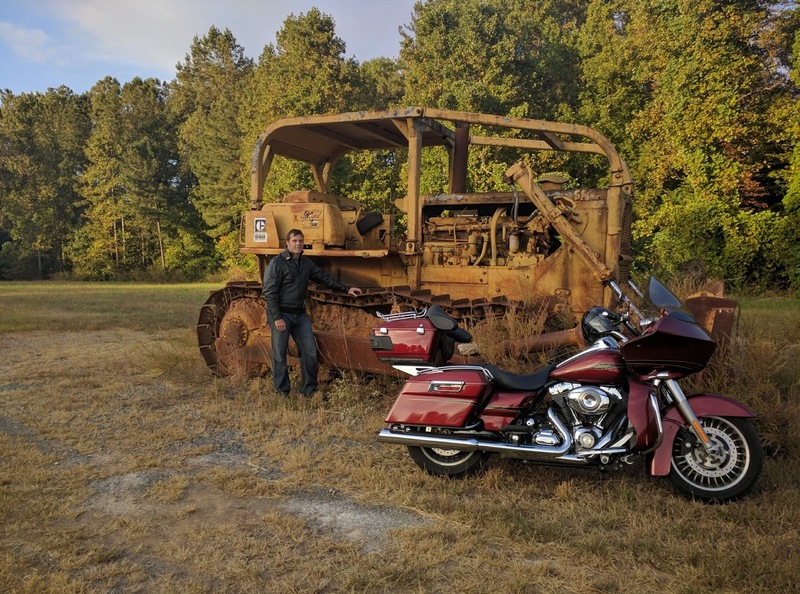 The problem was its hauling capacity wasn't going to cut it; we needed a truck with a bigger engine to haul a goose-neck trailer with a bulldozer atop and, in the future, other heavy materials and equipment. Chip scoured his favorite website, Craigslist, drooling over the Cummins diesel trucks that were out of our price range until he found the deal that you can't pass up, one of his famous lines, besides: "I've never been this hungry in my entire life." The truck was a 2000 Dodge Ram Cummins diesel with an extended cap and long bed for $2000. The exterior was in great condition but the interior looked and smelt like a boys locker room (yuck!) and it needed some mechanical work. Chip quickly set to replacing the starter and all brakes and brake pads, changing out 3 tires, flushing out the A/C system and much, much more. The interior's horrible stench and grime-filled crevices gave us the heebie-jeebies so, Chip also gave the interior the royal treatment with serious elbow grease and the help of Febreeze. All in all, Chip spent about a month getting the truck in tip top shape. Now it fires right up to a roaring rumble and is actually pleasant to sit in. By the way, Chip is absolutely smitten with his new truck. Our new truck and gooseneck trailer. Next, we needed a gooseneck trailer. Back to scouring Craigslist. 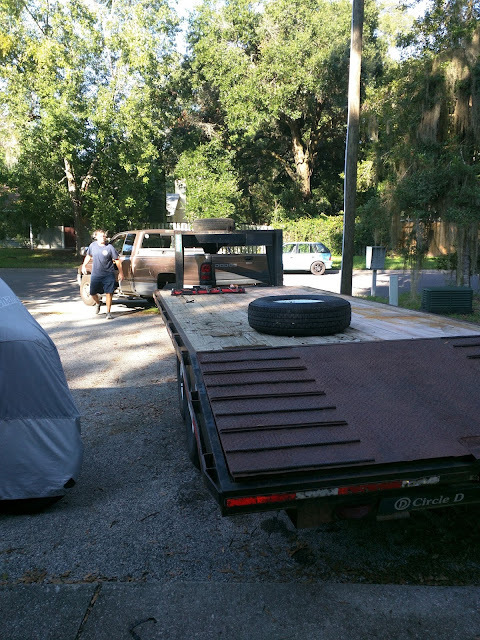 Chip spent two days traveling North and Central Florida to land on a trailer for $3000. It needed a couple new rotors and we decided to go ahead and replace all four at the staggering cost of four hundred bucks. In hindsight, the additional cost and time was a bust because Chip could have bought a ready-to-go trailer from another Craigslist seller for $3500. Oh, if only we had a crystal ball. Chip's dad, Manuel, on the bulldozer. This thing is pretty intimidating. 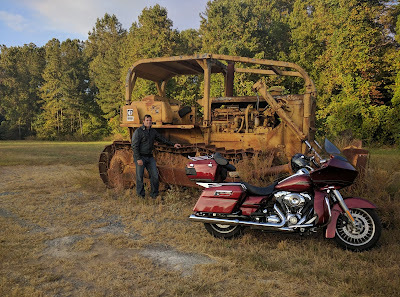 Until you see a mammoth of a bulldozer, which we happened upon while on our trip to the Georgia Mountains. Now that you know what equipment we were working with, it's time to continue the story. 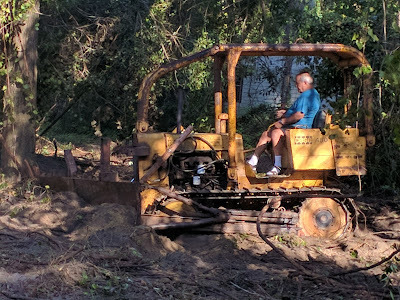 Chip and his dad hauled the bulldozer to the property to start the real work. I was informed that the bulldozer would just crank right up - cause that's what those old dinosaurs do. Right? Well, surprisingly, it did (would you look at that! ), until it shut off because it had bad fuel. In hot climates, fuel sitting in a gas tank (i.e. the equipment is not being used) can grow mold and algae due to the heat and humidity. We learned this the hard way when we took a family vaca to the Keys in an RV and traveled for 8 hours in July in the middle of the day without air conditioning because we didn't know we had bad fuel. That was rough. Anyway, once the bad fuel was replaced with good fuel we were finally ready to start clearing the lot. Super exciting! Stay tuned for Part 2....it's going to have a video (if I'm able to figure out the tech piece of blogging).